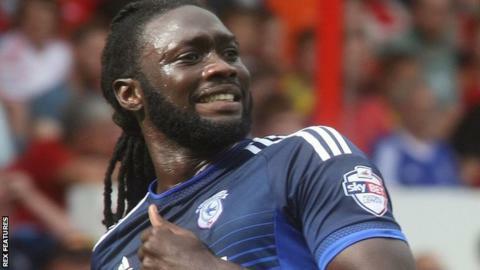 Kenwyne Jones will not be distracted by talks over his future, says Cardiff City assistant manager Scott Young. Jones, 31, is out of contract at the end of the season and can talk with other clubs in January. Young expects the Trinidad and Tobago striker to be focused on Cardiff's promotion bid. "Kenwyne's been around the block long enough to treat every game as it comes and be as professional as he can be," he said. "He scored two goals in the game before last [against Brentford]." The Bluebirds are just one point off the play-off places and next play MK Dons on Boxing Day. Jones, who joined Cardiff from Stoke City in January 2014, opened talks over a new deal in September but no agreement has been reached. Manager Russell Slade is hopeful Cardiff can secure the long-term future of last season's top-scorer in January, who has scored five goals this season.